#25 – Grapes – Kathryn’s own needlework sigil, offered up to our collection. (Kathryn’s deep love of grape motifs is legendary). #26 – TARDIS – From Jane Wyant, a Whovian tiny inter-dimensional call box should we wish to stitch in two places at the same time. We’ve still got a few open diamonds. 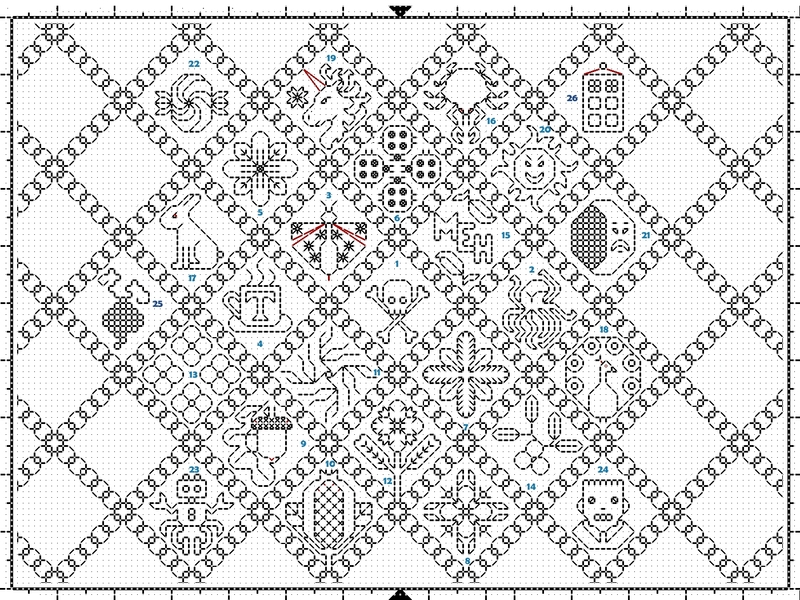 With some repositioning I think I can fit in seven more motifs. Feel free to send yours along. 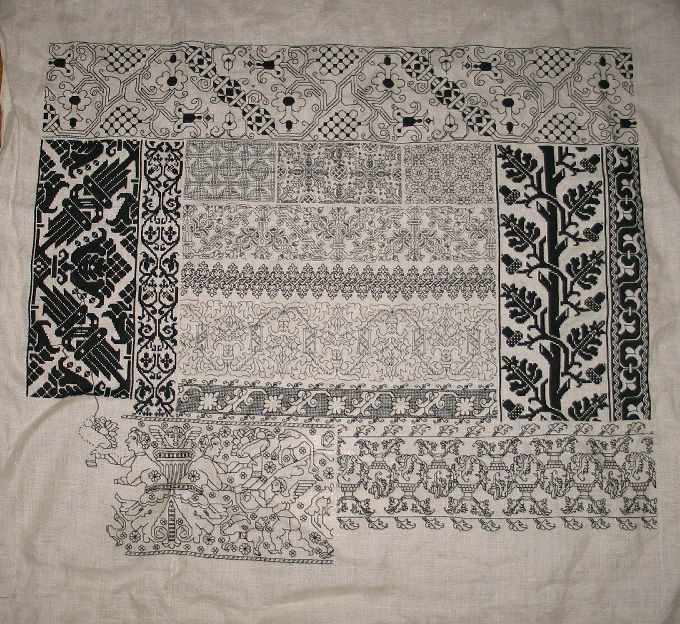 On my own blackwork sampler, progress is being made. My Lipperheide panel is proceeding apace. After I finish out this strip to the left hand edge of the stitched area I will fill in a narrower band below the sprigged chimney pots. Then I’ll edge across the entire bottom with something nice and dark – probably worked voided style. I haven’t picked out the designs for either of those strips yet, but as folk following here know, I enjoy bungee jump style stitching. Once the dark area is done that will leave only the top. Believe it or not, the part you see stitched here is only about 65% of my total piece. I’m not sure what I’ll do up there, but that’s still down the road. When I opened String I immediately saw the Tardis and whooped with delight. My own humble Group of Grapes is OK, but I’m far more smitten with the creativity and ingenuity shown by Everyone Else. Please note I was inspired to pick up graph paper and try this, despite my eternal Fear of Double Running. So There!